There are few things in the culinary world that can’t be improved with a little slice of truffle. Yes, even cheese can benefit from this earthy delight. I did think for a while there that truffle – be it oil, the actually item itself or its essence – may have jumped the culinary shark a while ago. You couldn’t even buy icecream without finding a dash of truffle added. But after a self imposed truffle exile, I have come back to the fray. 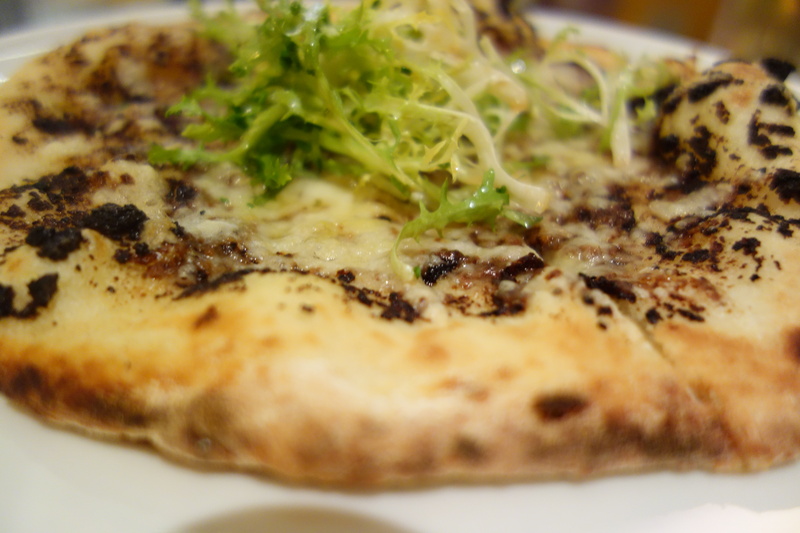 Thanks mainly to the unlikely combination of fontina cheese, pizza dough and black truffle. This piece of culinary crossover comes from the kitchen of Market by Jean Georges at the W Doha and landed on my table yesterday as a gift from the kitchen. The pizza itself is a specialty of he eponymous Jean Georges Vongerichten and can be found in several of his restaurants around the globe. Fontina is an Italian cow’s milk cheese. Fontina cheese has been made in the Aosta Valley, in the Alps since the 12th century. The original Fontina cheese from Italy is fairly pungent and has quite an intense flavor, although cheeses labeled Fontina that are produced in other countries can be much milder.